Some of the most beautiful of sights on the planet are the remnants of the most violent of scenes; The amazing Yellowstone National park is in place of the world’s most notorious “Super volcano”. As a rational conspiracy theorist, I have to constantly put up with the claims of Yellowstone’s imminent eruptions. This is probably why I am currently seeing a therapist as such ignorance can cause madness to the most calm of men. It is silly to think that we would not notice 100 meter uplift before a caldera forming eruption or the gateway to hell opening before a flood basalt. The monitoring of certain volcanoes leaves a lot to be desired but some things are impossible to miss. I don’t want to get my science and my conspiracy mixed up but if the government can barely keep information of their more unfavorable actions secret then I don’t really think they can hide modern society coming to an abrupt end. Flood Basalts and VEI 8 eruptions are the new disaster craze and arguably the most perfect for cheap headlines. After all unlike an impact event or an alien threat, we know that these eruptions are going to happen in the future and can track their unrest easily but still don’t know exactly when or where it will happen, and unlike Super bugs or ecological devastation, it is not an immediate concern or as scary in the short term. One thing is certain however if either of the eruptions were to start happening in the next 50 years we would know. Basalt and Rhyolite are the primary ingredients of some of most awe-inspiring eruptions that this planet has ever seen. The viscous rhyolite produces large explosive eruptions while the fluid basalt produces rivers of molten rock. Everything intermediate magma does, these two do better and a great deal better at that. The worst our planet can produce is something that no one truly understands to the fullest. Scientists can’t even agree on the climate affects of the Samalas eruption so the effects of a larger VEI 8 eruptions are not settled. Quantum mechanics are completely different from Classical mechanics, small scale motion is almost nothing like large scale motion but the laws of science are still not broken. It is a fact that something as simple as motion can be incredibly hard to understand and harder still to explain on certain scales. Volcanic eruptions, while not as complex, follows the same rules. After all you can’t compare a massive VEI 8 explosion with a Vulcanian puff, either in process or scale. The process of caldera forming eruptions are a very long and somewhat tedious process despite scientists recently discovering that large eruptions can happen in a few decades. So many different factors play a role in large caldera forming eruptions, such as regional faulting, the pressure in the chamber, the strength of the rock, and possibly the hydrothermal system. I will explain how each factor plays a role in these massive eruptions. I would also like to say, once again, that I am not a volcanologist or scientist, I am just a person who loves volcanoes and has read up on a lot of research papers. The pressure of the magma chamber is the most obvious and necessary component of any large explosive eruption. Magma chambers in “Super volcanoes” are usually cool and not very active with some chambers only having 5-10% melt, the magmas from the chamber stay there thousands of years and evolve into silica rich magma. The portions of melt in the chamber would likely make a very slow ascent to the top and the lack of massive pressure would aid in that. Isolated high concentrations of melt in a large chamber is what likely leads to the smaller cinder cone forming eruptions in large calderas. These pockets of melt are likely generated by smaller intrusions, the melt generated from an intrusion can stay molten for an elevated time in chamber after the intrusion ends. It probably doesn’t take much to destabilize the chamber to the point of a smaller eruption. The pressure generated by unrest, past or present, puts cumulative stress on the roof of the magma chamber. The effects of past unrest on the rock containing the magma fades after some time but in very active calderas, the effects are sustained for a longer period of time. Earthquakes and uplift put stress on the on the rock above leading to cracks and weakening any plug the volcano has over a period of thousands of years. The smaller eruptions in these calderas either increase or decrease the chance for a caldera forming eruptions. Smaller explosive eruptions can weaken the crust holding back the eruption as well as plug some vents while effusive eruption removes the vital pressure and eruptible magma while eventually being part of the same rock that is keeping the magma chamber under control. This phase will take thousand of years before the massive eruption and is the most benign sign but this is an important part of the phase of Super eruptions. The bulk of the pressure that is essential to the large caldera forming eruption likely comes from the heat and gas of the reactivated chamber. This what causes the period of unrest before the eruption but it still not enough. The accumulation of buoyant magma leads to the most severe period restlessness during the build up phase. The pressure from the accumulated magma sets the stage for a large eruption, making the system more susceptible to external variables. The actual size of the eruption however depends on how much eruptible magma accumulated to the top and the strength of the crust. Hydro-thermal systems within large systems are a source for steam explosions. These are a threat that is independent of the system. However before a caldera-forming eruption the heat, earthquakes, and uplift from the unrest would lead to more explosions and unlike the magmatic eruptions, the activity would be more pervasive and widespread. The hydro-thermal reservoirs would lose a great deal of volume through massive steam explosions and this would be the smoking gun even from unmonitored systems. The explosions would not be enough to be the tipping point and is not a crucial factor as some systems don’t have a large hydro-thermal systems yet still have relatively frequent large eruptions. Resurgent domes are an easy feature to spot and are perfect for scary headlines but are not a sign of an eruption. The greatest hazard from resurgent domes before a caldera-forming eruption are landslides. Some resurgent domes are of such size that if a large landslide took place during a period of severe unrest, it could destabilize the volcanic system and trigger a large explosion. The evidence for such slide could be buried. Regional faults covering magma systems are greatly influenced by the state of the systems. The pressure and the size of the chamber puts stress on the faults which leads to larger tectonic earthquakes, which does little to affect the system during dormancy but during large scale unrest, this likely acts as the tipping point. The elasticity and overall strength of the rock above the systems decides the scale of eruption. For brittle and weak rock, It is going to crack under the pressure much easier and for stronger elastic rock, even the most severe unrest may not produce an eruption without an external variable. If we would like to see where is most likely place we are going to find a “Super eruption” then we should study the roof of large magma chambers. This maybe a bit more hypothetical but I believe that volcanoes that have frequent large eruptions have weaker roofs to the magma chamber (Taupo is a possible example of this) and volcanoes that have frequent effusive eruptions have stronger roofs (Yellowstone). The direct effects from a VEI 8 eruption is one of the rare cases where Hollywood movies don’t actually show the truly terrifying scale of such an eruption. Let’s say that Toba realizes that it didn’t finish the job 75,000 years ago and erupts again. The explosions would dwarf Krakatoa’s 200 megaton puff and the ash cloud would be larger than the largest countries. Pyroclastic flows would ravage the entire island and make the entire Indian ocean inaccessible by boat and ground flight worldwide. This eruption could inject sulphur and fine ash to the mesosphere, which could lead a more significant climate effect. Global temperatures would drop and there would significant global dimming. Thank goodness this doesn’t happen often. Some of gas rich fine ash would devastate the agriculture and poison freshwater over a continent. Some areas would be unreachable for years and whether or not an event like this could kill all of humanity, it would erase all of modern society while it sending human advancement back thousands of years. Naturally an event like this would receive plenty of warning and not sneak up on us somehow and there is no system on that earth that is likely to produce such a large eruption in the near future. Just because these systems can produce large eruptions rather quickly doesn’t meant that the chances have suddenly gone up. It isn’t impossible for it to happen in the near future, we really don’t know if it will. So what? What is humanity actually going to do if it does happen? There are some disasters that you can prepare for and mitigate but this isn’t one of them and there is nothing anyone could do if it were to happen. The fish canyon tuff is more than 5,000 km3 of ash and the eruption took place 28 million years ago and some material likely deteriorated, not only that the finer ash from the eruption is a significant percentage of the material emitted. Eruptions like this could very well be larger then some modern calculation shows. When you scale disasters, people’s imagination immediately goes to what lies beyond the scale. Just google “F6 tornadoes.” and you will see how much that peaks people’s interest. A VEI 9 eruption captures the imagination of some and is a mysterious proposition. Most won’t deny that it is a possibility within Earth’s long history but there is no evidence of such events, an event like that would be rare and if it did happen in the distant past then the evidence leftover would not reflect the size of the eruption. A VEI 9 while entrancing is something that is only a conjecture. Effusive eruptions are not respected in the slightest among the public but are the deadliest and most simple form of eruption. Flood basalts are so large that it difficult to comprehend their scale. Some of the largest flood basalts hold so much lava that you could cover the entire planet’s surface with at least 2 meters of lava. Such massive eruptions have been linked to the biggest extinction events but some of the biggest flood basalts did not cause any large extinction events. Why? In order to understand why, we should break down how flood basalt happen in the first place. Flood basalts are generally cause by the break up of continental plates, a hotspot, or a mantle plume. It is even possible that some events are composite in origin. Flood basalt form large igneous provinces and are not a single eruption, they are multiple large volume eruptions and lasts for millions of years. You could argue that Hawaii is a small igneous province as Mauna Loa holds more than 40,000 cubic km and the hotspot is still strengthening. The hotspot delivers the bulk of its magma to one volcano. The Iceland hotspot is responsible for some of the largest effusive eruptions in history and has multiple volcanoes that are very dangerous, erupting explosively and effusively. Both systems could be a flood basalt in the distant future but are completely different. A system that erupts a 1 cubic km of magma a year is not going to kill 75% of all life. The CO2 released is going to go through weakly damaged vegetation and would not last long enough through the eruptions to have a massive extinction event. In order to cause extinction, the event must be intense. The size of the flood basalt is not as important as some would think. The formation of largest igneous province did not cause an extinction event while the Siberian traps almost ended life on the Earth despite not even the second largest province. The Deccan traps likely played significant role in the Cretaceous–Paleogene extinction, the Central Atlantic flood basalt for the Triassic-Jurassic extinction, and the Siberian traps for the biggest extinction event in the Permian era. I don’t believe that the global climate changes alone are responsible for the mass extinctions, Global cooling and warming happen with all flood basalts and only a few cause mass extinctions. The climate changes have to compounded with something else related with the eruptions. The Central Atlantic flood basalt event likely caused more significant global warming than cooling. The rate of magma expulsion was not enough to cause large scale cooling but it was enough to dump massive amounts of CO2 over a short period of time. This is just a theory and unlike the other two it is not as solid. The CO2 in that era was already high so an event like that would cause disastrous warming to an already hot planet. Compounded with the gas ravaging plant life, ocean acidification and a damaged ozone would lead to an extinction. For the Deccan traps the global cooling was likely the killer. The rate of magma expulsion alone was enough to cause major cooling, the gas would have covered large regions of the globe and, there was the issue of an impact winter happening at the same time as all of this. The cooling would have covered most of the globe in ice while little to no sunlight reached the Earth. This would be quite different from what the species of the world would be used to. The warming from the CO2 would take thousand of years to overcome the existing climate, A decimated plant life would slowly recover as the climate warmed and things would soon go back to being relatively sustainable. The Siberian traps is responsible for the largest extinction event by far but what caused it? The warming or cooling? Why not both? Everyone know about how the event happened over carbon rich rocks but the fact that 25% of the material was pyroclastic doesn’t get the attention it deserves. That means 250,000 to 1,000,000 cubic km of tephra or DRE of material were ejected. I don’t which it is but both are possible. At the minimum that is a Campanian Ignimbrite every thousand years and the most that is a Huckleberry Ridge Tuff in the same time frame. The Siberian traps was one of the most intense flood basalts to ever strike the planet and up to 4 million cubic km of magma erupted in a relatively short time-frame. The effect of disastrous cooling and warming likely worked together to create an extremely deadly environment. The global cooling and gas would have decimated plant life but it would not be enough to cover large portions of the world in ice and as such when the warming kicked in, there would be almost nothing to dampen it. The ocean acidification in response to this would lead to the oceans breathing out harmful gas that would make the Earth vulnerable to radiation from space. At this point Oxygen would be scarce and all forms of life would suffer. A lack of abundant Oxygen is what I believe is the killer for both the Cretaceous–Paleogene extinction and the Permian extinction. In Both of these events plant life was ravaged to the point where they couldn’t have been viable sources of oxygen while the acidic ocean would decimate oxygen producing microbes. It may sound a bit dramatic but during both extinctions more than half of the world’s life forms were killed. These eruptions hold plenty of mystery and will always capture the imagination of scientists but may never completely understood in its effects and if it were to happen soon then our understanding would mean nothing as we would be dead. As annoying as I find people talking about this events as an imminent threat, I understand it is out of lack of knowledge, after all when I was twelve I was one of those people. But people who do this knowingly embarrass themselves. 4 million km3- can you imagine that in one go! VEI-11 (or mega-ultra-super-terror-fun-fun time!). Now *surely* that would be too ridiculous even for Hollywood. Right? Seriously? What? The Sci-Fi channel? Oh for…..
Don’t give them ideas. We all know how desperate they are now. And here is the image. Of course, the black hole is the hole in the middle. The rest is just stuff which happens to be falling into it. The crime that frames the hole. That is some cool stuff. How was the picture taken. By combining telescopes across the world, pretending to be a single telescope. The ring is actually not a ring, but is caused by light bending around the black hole. The dark shadow inside is a few times larger than the black hole itself. Thanks for that! I was looking for a video that gave a clear description and that’s spot on. That one is the black hole in M87, 50 million lightyears away and 6 billion suns, it is not pointed perfectly at the earth but if it was we would call it a quasar (it is more likely to look at these active galaxies dead on if they are further away which is why labled quasars are all really distant). What I do not understand is how it is possible to see the hole of the black hole. 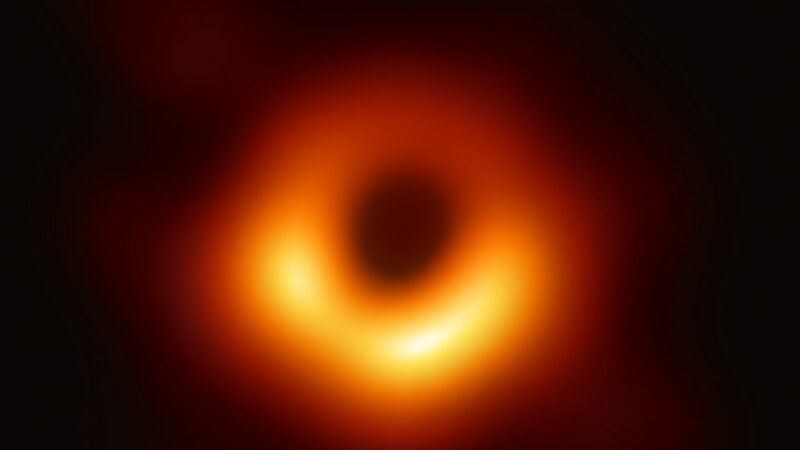 It’s supposed to be surrounded by light-glowing gas and.matter surrounding the event horizon, so shouldn’t the black hole.be surrounded by light all around itself? Yet we see a black hole, surrounded by just a disk of light glowing matter. Funny enough I was just obasrving m87 yesterday, and all the small galaxies just around itself. The black hole is surrounded by a hot plasma, which is falling into the hole. The plasma emits radio waves (synchotron emission) which what the telescopes detected. The photons travel very close to the black hole, and under influence of the extreme gravity, their paths bend around the hole. This is the ring: The photons directions are distorted as if viewed through a poor quality lens. If the photon gets too close to the hole it may cross the event horizon. That is a one-way journey and the photon will never appear again. That is the dark centre of the circle: photons that attempt to travel inside the event horizon. The image proves that black holes eat photons. Even the speed of light is not enough to escape. The one that really makes people’s heads explode is Hawking radiation. That’s how black holes shrink and eventually evaporate! Essentially things are so energetic and exotic near to the event horizon of a black hole that things called virtual particles become possible. Right on the edge of the event horizon two particles can spontaneously pop into existence. One just inside the event horizon and other other just outside the event horizon. One is the particle and the other the anti-particle. Normally they would just come back together and annihilate. However at the event horizon one is trapped inside, and the other isn’t so it can escape. The one that escapes becomes part of the Hawking radiation. And yes that is Hawking as in Stephen Hawking. This link to a picture on twitter, shows a simulation based on Einstein’s equations and the new picture released yesterday. Thanks for the nice article Tallis. Just one remark concerning the picture of the socalled Rainforest Jasper (no idea why this is the trading name of this type of rock from Mount Hay, Qld, Australia!). It is not typical for Rhyolite in general. The rock pictured is a concretion of small lithophysae (commonly named thundereggs by rockhounds). Lithophysae did form in a cooling lava body and exsist of a sort of co-crystallization of cristabolite (SiO, but quite different crystalform compared to quartz) and Feldspar. The filling of the cavities (those are characteristic for a lithophysa) are quartz and chalcedony. Lithophysae are rare, in consideration to occurrance of Rhyolite. Here a pic of Nesselhof Porhyry, a type of Rhyolite found in the Thuringian Forest Germany. Don’t mind the tube shaped lithophysa at the top, it distracts… Quartz and Feldspar crystals are embedded in silica rich groundmass. The layering structure is common but non layered rhyolite is common as well. That wasn’t Tallis: the two images were added when editing the post into the site. Yes, it is far from typical. Images of more usual rhyolite can be readily found. I used mind control on you in order to obtain that picture and am still using it so that you will like whatever I make. Well go on, go ahead, haha! Still no accurate dates of prehistoric lava (200-400 years is a big range) as the paper still makes references to studies in the 1980s and earlier but it at least gives overalap and flow boundaries. It appears the small shield structure slightly uprift of heiheiahulu is indeed part of that eruption, though an older vent that later became inactive in preference to the larger shield. Also the minimum date of that area still leaves in the possibility that the heiheiahulu flows are as young as the early 19th century, as well as the likely chance the ‘1790’ flows are also not of that year. Thank you for a fascinating article, Tallis! The dragons would very much welcome a post from you on your hiking adventures! It sounds absolutely fascinating. I have hiked in the area myself but mainly remember how cold the mountains were at night.. and the goats eating the clothes outside the neighbouring tent.. Thanks Albert. I only know enough geology to be dangerous, and while this site has lowered the danger level, I wouldn’t attempt my own post. However, if you or somebody else is interested I would certainly be happy to help out. I have never had the chance to see something like that so close. That’ll go on my bucket list. The annual uplift rate has been accelerating…most likely due to a new sill forming under the caldera, and is now a very robust ~ 25cm/yr and has been ongoing for the last several years. Before that, on/off uplift (to a lesser extent) has been detected for over 15 years, so the current inflationary period is not a just a short-lived burst of activity. There are several elevated risks associated with this system, most notably around 100 km3 of water-rich/highly volatile crystal-mush magma chamber at shallow depth, which recent papers suggest can get re-rejuvenated in just a matter of decades (or even years). Given that there are only a few (very minimal) fumaroles or other routes for de-evolved gasses to escape , it is feared that much of the uplift is also due to pressure accumulating at unusually high levels at depth that will greatly enhance the explosiveness of any eruption that may break through the surface. Anyway, here’s the rest of the Wiki-article on Laguna del Maule which is unusually comprehensive. Sure would like to get some further insight into the prospects fer an eruption? Note, my comment was my own high-end estimate of 100km3. The shallow reservoir is much larger, with new data showing about 450km3 of shallow rhyolitic magma. Should it all erupt as in a caldera collapse, that would transform to around 1,000 km3 of ash, rock and lava..i.e. borderline super-volcano status according to Brad Singer, a research geologist at the University of Wisconsin who has been studying Laguna del Maule. Anyway, the real reason I brought it up, is I only recently became aware of the rapid inflation and eruptive potential of Laguna del Maule, (since we’ve rarely discussed it here on VC), and I’m kinda fishing for comments and opinions from those far more knowledgable than I.
I would appreciate it if you take a few minutes and check out Laguna del Maule and tell me (us) what your impression/thoughts are? Also, if you have access, check out the Dec. 2018 issue of Scientific American, which had an article on “How Supervolcanoes Erupt” that featured/focused on Laguna del Maule. It’s this article that really piqued my interest. Very informative, (but rather pedestrian as far as hard data is concerned). I wasn’t aware of that study. The system is experiencing an intrusion that is capable of destabilizing a large sillic system and is a reasonable threat in next 100 years. Albert has brought this system in his article. Unless the volcano is famous or has a large population near it, it is not going to get a lot of attention. The los humeros volcano has 1,200 cubic km of magma and is possibly under intrusion does not have a lot studies dedicated to it’s potential. Thank you Tallis….and all due apologies to Albert for forgetting his write up/overview. If the rapid rejuvenation process of so much rhyolitic crystal mush is real (as the new papers are mentioning), then I suspect that we’ll be rethinking what signals to look for in other volcanic systems as far as inflation causation is concerned. As would any-one who but glances at that area’s map, I was struck by fear the entire Bay of Naples was a Yellowstone-scale caldera. With Ischia, Somma / Vesuvius, even the Flegrei Complex as ‘edge effects’ and flank eruptions ?? I did some hasty Googling. IIRC, active investigation in that area is routinely vetoed by the Neapolitans, for fear any drill hole might rouse sleeping monsters. Passive sensing and some off-shore ‘pinging’ apparently shows the main Bay underlain by ‘ordinary’, tidily layered sedimentary rock, rather than caldera back-fill. Is the largest land based flood basalts to ever flow over land ( in the most recent 1,2 billion years ). This happened 201 million years ago. The lava coverage was around 11 million km2. Before the arera broke up by seafloor spreading. It lasted 500 000 years and erupted maybe 12 million km3 of lava in short pulses. It went very fast at times with ( collossal gas output ). Imagine erupting fissures that coud have been in worst cases 500 kilometers long, with curtains of kilometers high ligthing filled lava fountains gushing all along it. Curtains of kilometers high basalt plinian lava fountains strecthed across the horizon. Out from the fissures comes sheets of channelized Aa lava the size of UK and Sweden. These are VEI 8 or 9 effusive eruptions. Most of the times it was likely much smaller. ( but very very intense at times ). Its hard to imagine the scale of these events. From orbit Earth glowed intensely when it was going intense. It was at some times just as intense as Siberian Traps. The Triassic – Jurassic Dying event is almost certainly caused by the mammoth gas output and volcanic co2 global warming and toxic sulfur gases from the Pangea flood basalt fissures. CAMP province released alot of co2 gas and caused massive short term warming. That and later hyperactive seafloor spreading in the Young Atlantic also relased alot of gas and rised sealevels. It woud be intresting to really know the full effects of the massive CAMP basalt flows at their peak. I have one slight disagreement. I’m not necessarily sure that the signs before a super eruption would be particularly obvious, at least for a volcano that isn’t being actively monitored. Would there be signs? Definitely, but determining the difference between normal inflation and inflation that precedes a super-eruption may not be particularly easy. The issue is that we don’t have a long enough time to measure influx into a volcanic system. We only can see the magmatic input into a system that occurred in the last few years, not the 400 years before now. So a volcano that saw Iwo-Jima style magmatic input for 200 years before the magma inflation stopped may still be straddling the threshold between erupting a big eruption and not doing anything even 200 years later. In this type of instance, it may not take a large injection of magma to create a big eruption. Another point worth making is that Rhyolitic eruptions seem to erupt extremely fast and violently. We know the violent part, but the “fast” part is what I think would catch a lot of people off guard. Chaiten was a great example of this, as it erupted extremely quick due to the explosive nature of the rhyolitic magma and the deep chamber. From what we know about the Taupo Volcanic Zone calderas, they also seem to exhibit this trait, which is frightening considering how large and explosive they are. The Tarawera eruption seemingly occurred in a flash from historical accounts. The more pressure there is that is held back, the more likely it is that you get an eruption that accelerates extremely quick. Adding to this, it should be noted that in crystallized form, magma won’t exert tons of upward pressure. But if the magma reheats or is rapidly depressurized, that can change in a flash. I think of Tarawera as an example of what it and it’s nearby neighbors are capable of doing. Going from stone cold dead to full on catastrophe in what? 12 hours? Less? To me it is not the just the intrusion that would make the noise. It would be the gathering of the eruptible magma to the top. The resurgence of the area would be so dramatic it would very hard to miss. The massive steam explosion and phreatic activity would act as a signal for attention and the moment somebody just looks at the system, they would see the potential eruption. These types of eruptions do happen very quickly. The long valley caldera went from normal to on the brink of the eruption in a 2 decades. The build up for an eruption would also depend on the system, the long valley caldera and taupo being the scariest for me. To me it would not be the inflation would grab the attention it would be the large earthquakes and massive steam explosions. Unless to say that some geological agencies actually acquire the funding to monitor a previously unknown volcanic system. Yeah there would definitely be signs, and potential smaller phreatic eruptions before the occurrence. I’m just not sure they would necessarily be the signs people think would indicate a supervolcanic eruption is about to occur vs. a standard eruption. Also, the progression in the event of a rhyolitic eruption would possibly happen extremely quick. I wouldn’t be so confident in this belief if it weren’t for the fact that we have research that shows that some of the biggest rhyolitic eruptions went from pre-eruption to eruption extremely fast. My understanding is one of the expected pre-mega-event signals for a massive caldera-collapse includes smaller eruptions around the ring fault that lowers the underlying magma reservoir’s volume/pressure….eventually allowing the caldera floor/chamber roof to fail catastrophically. We’ve seen this process in action in smaller systems, however since we haven’t seen a super-eruption in human times, it’s only a guess that a similar process would be involved in super-eruptions. It may be that one of the factors that differentiates a full-fledged super-eruption from a ho-humm ring-fault eruption is that in the case of a super-eruption, there was ZERO pre-eruptive ring fault eruptions..which in turn allowed rhyolitic magma to reach critical failure temp and pressure. I would think that ring fault eruptions would act as pressure-relief valves and limit the crystal mush re-juventation rate (due to lower heat transfer efficiency) thus inhibiting a catastrophic eruption by keeping pressure in check? If a super-eruption requires a super amount of magma (as it did in Toba), the problem is keeping the chamber roof stable. If the magma is too shallow, the roof lacks support and will collapse. (It is like taking the supporting pillars of the cathedral roof away.) For a Toba-sized chamber, you need the magma chamber to be 10 km deep, in order to spread the load to beyond the chamber. You cannot have a super-size magma chamber shallower that that: it would erupt before it could get to that size. Now take the chamber and add a bit of heat. It melts a little of the roof. Eventually, it gets thin enough that the load presses on the centre, the centre can’t hold and begins to sink. The magma is pushed to the sides, where the ring faults are ready and waiting. Let Toba begin. Later in the process, the centre breaks up enough that there is also a central eruption, but this is after peak pressure and so not as large as the ring fault eruption. The ring fault behaves like a massive rift, erupting all along its 100-km length. That keeps the explosions down, as the pressure is spread out over a long fault. In this model, there is inflation over a huge area (200-km or more across) but developing slowly (many millennia). Eventually there should be a bulge reaching half a kilometer high. The sign of impending eruption, however is deflation in the centre of the bulge, which is a sign that the roof is failing. Flood basalts are a step up. Here the bulge is even bigger, many 100’s of kilometers across and perhaps 2 kilometers high. (Africa?) Gravity now directs the dikes radially away from the centre. That is seen in the Columbia basalt, where the dikes extend across states, away from the original centre. This spreads out the flood basalt over a huge area, and it comes in pulses as each new dike forms, erupts, empties, solidifies, and blocks. The east african rift us in two parts and while the northern and more eastern part has become volcanic and done flood basalts, the western and southern section has not, only minor volcanism has occurred until recently, as the depths of the lakes there show (some over 1 km and all over 400 meters). The virunga area has apparently been active for millions of years but obviously there has been quite a significant increase in activity more recently. The nephelinite and alkali basalt magma of the area is made by minor melting so the fact that so much of it is being erupted there says a lot about the potential of the area, it is probably only a matter of time before the area completely rifts into the mantle plume and all hell breaks loose. Imagine fissures thats longer than 450 kilometers! in largest cases .. complete with kilometers high lava fountains all along its lenght. Curtains of fire strecth across the horizion…. Nothing in the central Pangea coud have escaped. The lava fountains went up many kilometers. These Flood Basalts created enormous aresol and gas plumes that poisoned the air for 1000 s of kilometers. The effects was global dimming and global warming and lowering of air quality. Very massive lava flows exists in africa and america and europe the last remains of this province. It makes sense that CAMP did even larger and longer flows sometimes when it was going. Flood Basalts flows are often very thick and columnar and uniform good example of massive sheet flows erupted from fissures. That lava fountain is about 150 meters high and maybe 400 meters long, with an eruption rate of hundreds of m3 of lava per second (it was a lot smaller when HVO saw it the next morning). This fountain erupted about 8 million m3 in 6 hours, an eruption rate of about 1.2 million m3/hour, 50,000 m3/minute, or close to 900 m3/s. This is just off the top of my head so I’ll have to check those numbers but it still gets the point across. Can make a Deccan Traps sized event? Big scary thing is on the horizon once it finds a way through the seams between the cratons! It might be similar size but i think it will be quite a different style to deccan traps. Deccan was not a rifting event, it was almost like hawaii except with way more crust so the magma chambers could get really huge and so it could be better to compare deccan to a way bigger version of the columbia river basalts. The magma supply to the deccan traps at times would have been well over 10 km3/year at least, feeding an entire area the size of the UK with the same base magma supply rate as kilauea today, up to potentially much more, tens to maybe over 100 centers that for all purposes should be termed as basaltic supervolcanoes. The 1000 km3 eruptions likely were every few decades to centuries, and probably very episodic, but smaller eruptions (still huge in their own right, holuhraun to skaftar fires size) were probably nearly continuous for close to 10,000 years at several separate bursts, with at least one probably being responsible for the big hit of the K/Pg event. And this was caused by a relatively average plume much smaller than hawaii or east africa superplume. The probable future event within africa is more likely to be similar to the opening of the atlantic because the area is already a rift zone, but the rifting is rather slow so the eruptions might be much faster and more like the huge pangea breakup events, it is a real possibility even if not a certainty. If it was oceanic its woud make a Tamu Massif right? And after finally finding the recorded footage of the old LERZ webcam, turns out I again have to change the numbers. That big fountain was erupting between 5 PM May 27 to 8 AM, 13 hours, and the area covered is still about 2 km2. However the thickness of the lava is rather higher than I thought, more like 6 meters than 2, so a total of about 12 million m3. This equates to a rate of just under 1 million m3/hour, which is the highest eruption rate from kilauea in decades and equivalent to 277 m3 of lava per second. This is twice as fast as the average HVO found during the main stage of fissure 8, though not as high as several surges. This is also only in dense rock equivalent, the erupting lava is about half as dense as the solid lava (and 3 times less dense than non vesicular basalt), so the eruption rate of total magma is closer to 600 m3/s. Not every plume is the same and not everyone makes a flood basalt. It also makes a lot of difference whether it hits continental or oceanic crust (in fact plumes are difficult to get under continental crust because it insulates too well, suppressing convection in the mantle). The size of the shield does not say how strong the plume is. Its enromous strenght is not blocked. BUT.. its hidden beneath the Tanazia and Kenya Cratons.. they are one of earths very thickest litospheres and very very oldest. Volcanism and rifting in Africa occurs at the seams between the Cratons. Thicknesses can exceed 300 km at these cratonic cores as thick as it can get on a planet of Earths size. Getting though all this is very very difficult. Not even a Super mantle plume can hurt the thickest cratons. African Superplume is having trouble with ancient continental cores and is therefore much less visible. Are you sure about the African super plume being the largest? You keep repeating that, but if you read up on the Pacific super plume, you might find that the Pacific super plume is the largest. It also rises straight up and isn’t smeared sideways like the African super plume. Do you have a source for the notion that the African super plume is the largest? Nice article Tallis, thanks! As a true conspiracy theorist though you should know the government doesn’t try to hide anything, they just label people who notice something is a bit weird conspiracy theorists with a curled lipped sneer to make sure others denounce them in public a cross to the other side of the street when they approach. Like Julian Assange? The man never stole documents or did a crime but still needs to be arrested. Pretty much the bane of anyone who drops a tire off the pavement. Also known locally as “sugar sand.” Stuff actually squeaks when you walk on it if it’s dry. That sand is amazingly unweathered for beach sand. 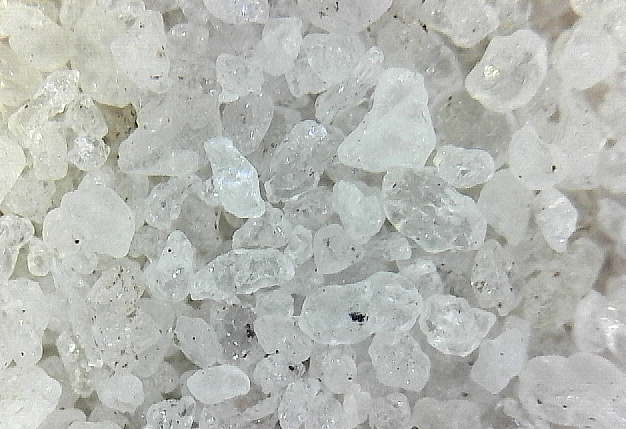 Lots of facets you don’t really see on UK sand (even out of the garden). A different quake on the big island. Also a 3.0 which has not been reviewed. A 5.3 that deep is a significant quake, its not going to be an eruption soon on its own but it is really only magma at that point, 19 km deep is in the mantle there and right at the base of hualalais feeder system. The eruptions from hualalai are known to ascend from depth to the surface very fast though, so things will probably happen from first tremors to eruption in a few days at most. If things start getting lively there then it is definitely something to watch. Depth is now listed as 13 km. The seismograph only shows a tectonic signal (and a fair amount of daytime noise which I assume is artificial, perhaps road 190). It may be Hualalai but the sequence seems to line up with the stress lines from Mauna Loa – in fact it follows one of its lava flows quite closely (accidentally, I am sure, at that depth). Wait and see. Well it is known that above hotspots tectonic signals can cause or turn into magma signals, iceland is obvious but it does happen in hawaii too. Last year is a perfect example actually, the big quake on May 4 was tectonic, the next big slip after the similar 1975 quake, but it was initially caused by magma pushing the south flank, and it in turn probably opened a deep and wide connection along most of the depth of the east rift that allowed the entire upper magma system to completely drain out. The deflation at the summit only started after May 4th, and then about 3 weeks later when fissure 8 reactivated it turned a fairly normal kilauea eruption into a mini flood basalt and the biggest lava flow on earth in 250 years. Any quake within the magma system of an active volcano is a potential eruption sign. We also dont know what hualalai does before erupting, we dont really actually know what any of the volcanoes in hawaii does before erupting because none has initiated a completely new eruption since the 1980s but hualalai very probably behaves much less predictably than kilauea. Kilauea gets lots of magma all the time, so much so that it is almost aseismic, but magma is generally not supplied in huge amounts all at once either so eruptions are usually frequent and small and eventually evolve into a continuous vent somewhere as has happened several times in the past century abd will probably happen several more times in the coming century. Hualalai is probably the opposite, the initial start being very aggressive and with lots of earthquakes, and it goes from doing nothing up to full on eruption in maybe a week, and magma volumes are low overall but tend to go all at once so things are fast and furious when the eruptions begin. The 1800 lava contains a lot of xenoliths so it must have ascended very rapidly. Hualalai has had some pretty huge eruptions and a lot of evolved magma so it must have a magma chamber but it is probably quite deep, too deep to go caldera. You have a point (although even in Hawai’i most tectonic quakes do not lead to eruptions). My point is that the main quake was not under Hualalai but offset, and the aftershocks are on a line pointing away fromMauna Loa, suggesting the fault that gave way is a stress fracture from the big mountain -not the nearby volcano. Of course that doesn’t mean a connection can’t develop. But I would keep an eye on Mauna Loa. I think this most likely just due to subsidence of the island though it is true that those usually occur deeper. If it is pressure building up within Hualalai there is no reason to think the shallow system will give way any time soon and it will be very noisy when it does. I would expect a few magnitude 6 and maybe a 7 deep beneath the volcano and/or in the decollement of Kona. Mauna Loa seems too far to me but it could be behind it too. As far as that earthquake is concerned I think the difference between the volcanoes and where we draw those boundaries us pretty redundant. Mauna loa as a volcano is most of the thickness of the island under its summit, but mauna loa as its own mountain is only 2 km tall, the island is basically all the same sort of basalt from the perspective of where the quake was, so looking at it that way it is probably not tied to mauna loa specifically but just the general mass of the whole island. However even if the quake is completely tectonic it still occurred within the magma system of a volcano so there is inherently a risk with that. It could just be that hualalai isnt that well known and no-one wants to jump to conclusions, because if a tectonic magnitude 5 quake happened 13 km under kilauea or mauna loa I dont think people would be writing it off as unrelated. The earthquake is not exactly within the system of Hualalai but rather beneath the flank, if it was beneath the summit or in the rifts it would be different. I cannot look it up right now but from memory the depth of the quake roughly coincides with the contact between the volcanic edifice and pre-existing ocean floor it could be a weak spot where a fault has developed, the flank is probably not mobile as a block as the Kona area though. So far nothing suggests that the volcano might be entering a phase of unrest, a trachyte eruption is in the past behaviour of Hualalai but is has been about 100000 years since it last did one of those. I didnt say it would be the start of a period of unrest, just that this is probably what that would look like, a deep and strong earthquake that is generally centered under the volcano. It is also something to consider what would cause the quake in that location. If more earthquakes start in the general area then that is where things get interesting. I will make a map on google earth of the most recent hualalai flows, to see the general size of the eruptive events. Without knowing the thickness of the flows it can be hard but in general 7 meters is a good estimate. The tropical small town feel is absoutley lovely! Scandinavia needs astrogeoengineering to become less brutal in climate. Problem is that it varies a lot, the thickness next to a perched channel can get to 20 m but the aa sheets will be of 3 m. And also a lot went into the ocean. The earthquake is most likely away from the conduit of Hualalai given that the conduits of Kilauea and Mauna Loa seem to extend vertically from the summit to at least 30 km. It could be a volcano-tectonic quake from a fault responding to pressure from Hualalai (or Mauna Loa) or it could be just tectonic due to the unequal sinking of the Big Island. But even it is HUGE compared to most other volcanoes in the world. Hawaii being the worlds most powerful oceanic hotspot makes the largest volcanoes. Etna haves 600km3… absolutley tiny compared to Hualalai. Hualalai is actually bigger than kilauea, it is also bigger than mauna kea. Most of it is depressed under the huge mass of mauna loa, which has subsided it more than would be expected for its age, same thing happened to kohala, and also kahoolawe next to maui, both of which are actually the tops of volcanoes similar in size to mauna loa… Kilauea will not have this problem because it is growing on the side of mauna loa, so it might grow quickly to a great height. Loihi seems to be growing on its own rather than through the flank of an older volcano so it might not ever get as big as kilauea probably will. This is actually something many reconstructions of older hawaiian volcanoes dont take into account, newer volcanoes can significantly deform their predecessors or submerge them much more than their age suggests. If a volcano gets pushed too far down it will also be a peak on the bottom of the crust, which will probably serve to divert the flow of magma away from it which would have obvious implications. This idea could explain kohalas premature extinction as well as why mauna kea is more evolved in its lifecycle than hualalai despite being younger. Magma being diverted away from mauna loa is also probably the reason for kilaueas massive supply rate. Then most of Hualalai is pushed down and buried under Mauna Loas immense pile. A new post about the recent seismic events at Agua in Guatemala. Sadly Steve Zissou was not able to attend!